As the voice of Newcastle University students, The Courier has always been an expression of student news, views, and opinions relating to campus life and how the University operates. 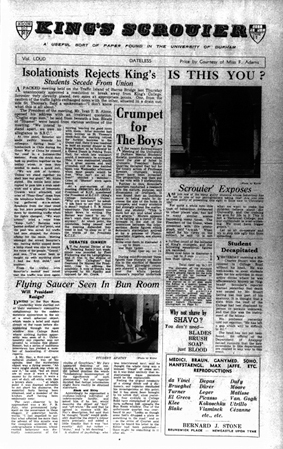 The Courier archive has been digitised and you can now search and browse over 65 years of reporting from the first edition in 1948, when the University was still known as King’s College. 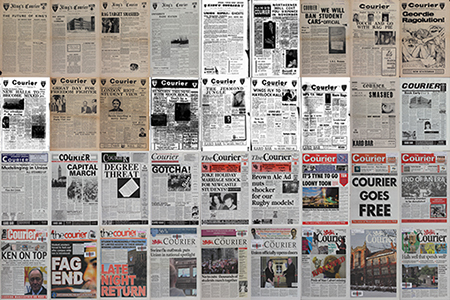 View the Courier Archive online. Courier alumni Mark Sleightholm has begun documenting the history of our student newspaper on a dedicated Courier History site. This gives a fascinating insight into reporting trends, recurrent stories and issues, and profiles of the different sections through the ages. In this Courier guest blog series, we have added to this site’s content and illustrated it with images from the digitised Courier archive. In 1948 what is now Newcastle University was known as King’s College and formed part of the federal University of Durham. Early in the year several Durham students established the Palatinate newspaper, and in October one member of the editorial team, Allan Marsh, decided to set up a paper for the Newcastle campus. Anyone was invited to help produce the paper, “regularly or spasmodically”, while Stuart Shaw was appointed editor. 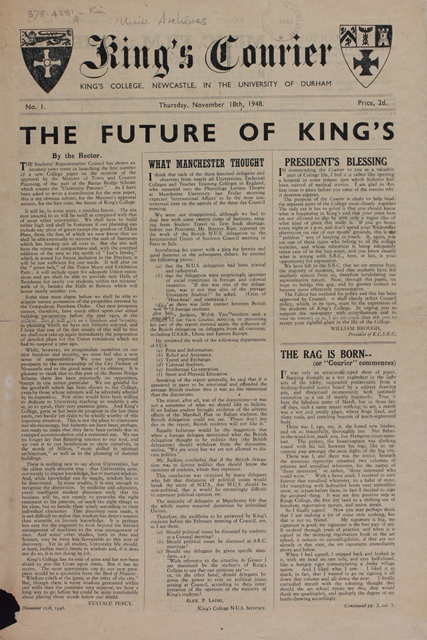 The first issue of King’s Courier came out on 18 November. 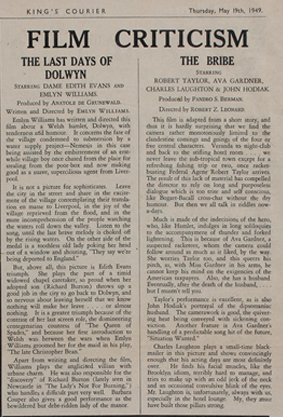 The early papers were generally eight pages long and came out once a fortnight. 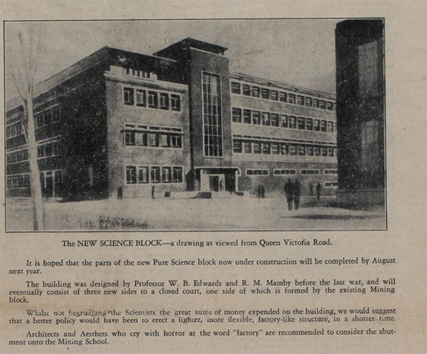 They focussed on such riveting topics as meetings of student societies and the opening of new buildings on campus, but also reported on University sports matches and reviewed books, art, theatre and – on some daring occasions – films and music. There were few photographs, although there was generally at least one on the front page, and several cartoons and illustrations, drawn by Courier staff, appeared, alongside an occasional crossword. There was humour, too – for 1952’s Christmas issue the staff produced a four page supplement called King’s Scrouier, which parodied many of the Courier‘s contemporary news stories, reviews and even adverts. The letters page became a forum for discussion, with some debates continuing for months. 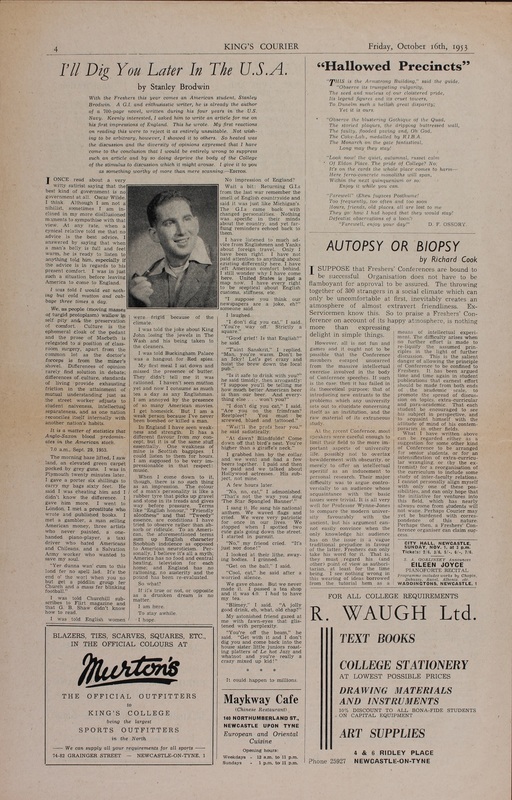 Particular controversy came in 1953 with a series of articles by Stanley Brodwin, an American student at King’s, and an aspiring playwright. His candid style and criticisms of British customs prompted fierce replies in the letters page, with his plays attracting similar outrage. At this point the students’ union was split between two institutions: the Students’ Representative Council, which dealt with politics, representation and societies, and the Union itself, run by the Union Management Committee, which ran the union building and organised social events. The Courier was overseen, and eventually funded, by the SRC, but was always (at least in theory) editorially independent of both SRC and Union. This entry was posted in Courier, Special Guest and tagged Courier, King's College, Newcastle University, Newspaper, Student by nspeccoll. Bookmark the permalink.